Founded in 1952, the Institute of Islamic Studies at McGill is a dynamic community devoted to research and teaching in a broad range of related fields and languages. Building on its origins as a place where Muslims and non-Muslims came together to study the multifaceted worlds of Islam and Muslim texts, peoples and cultures, the Institute has always maintained a mix of scholarly, community and other engagements in Montreal, Quebec, Canada and worldwide. Our diversity of perspectives and approaches to Islamic Studies, as well as our local commitments and global engagements, have made the IIS a unique institution in the world. McGill University's Institute of Islamic Studies was founded, along with the Islamic Studies Library (ISL), in 1952, and since 1983 both have been housed on the main campus in Morrice Hall. Until 1 June 2001, the Institute was a teaching unit of the Faculty of Graduate Studies and Research. It is now part of the Faculty of Arts, with its main focus being the disciplined study of Islamic civilisation throughout the scope of its history and geographical spread. In its academic programmes, it gives attention to the origins of Islam, to the rise of the civilisation in which Islamic faith was the vivifying factor, to the forces which shaped the civilisation, and the changes it has undergone. It is also concerned with the contemporary dynamics of the Islamic world as Muslims seek to relate their heritage from the past to the present. Courses, seminars and possibilities for research are offered in: Islamic languages (Arabic, Persian, Turkish, and Urdu), in Islamic history, in the social and economic institutions of Islam, in Islamic thought, and in modern developments in various regions of the Islamic world. The work of the Institute is carried out as a joint effort, uniting Muslims and non-Muslims in an attempt to understand Islamic civilisation. The teaching staff and students of the Institute include Muslims and non-Muslims from a variety of countries: Canada, U.S.A., France, Turkey, Egypt, Ghana, Indonesia, Iran, Lebanon, Pakistan, India, The Netherlands, Syria, UK, etc.. This strongly international atmosphere at the Institute provides an opportunity for face-to-face exchange among students and scholars at various levels. Frequently during the academic year, the Institute invites prominent scholars in the field of Islamic Studies to give lectures which are open to the public. Throughout its history, the Institute has provided a special outreach service that has brought students to the Institute from a number of African, Asian, and Middle Eastern countries. An important feature of such efforts has been the exchange of visiting professors, which has developed firm links with many important Muslim universities. These have been supported by the Canadian International Development Agency, the Ford Foundation, the Rockefeller Foundation, the Aga Khan Foundation, and the Alavi Foundation, among others. The Islamic Studies Library (ISL) has grown from a modest departmental collection to one of the most important in the field, containing over 110,000 volumes. The ISL is a research library, intended to be of primary use to post-graduate students and faculty, with a reference section at its centre. It is also an important resource for undergraduate students taking courses offered by the Institute and for the larger Montreal community. The ISL's collection can be divided into three major categories: printed, manuscript and audio-visual materials. All three categories consist of materials in European and Islamic languages: English, French, German, Dutch, Spanish, Italian, Russian, on the one hand, and Arabic, Persian, Turkish (Ottoman and modern), Urdu and Indonesian on the other. L'Institut d'études islamiques de l'Université McGill déplore et condamne la montée récente au Québec (ou ailleurs) d'attaques et de propos racistes contre les personnes musulmanes ou perçues comme telles. En tant qu'éducatrices et éducateurs nous consacrant à l'étude de l'Islam dans toutes ses facettes et ses manifestions, nous sommes déterminés à continuer de travailler à l'élaboration et au maintien d'un programme d'études - et d'une société - où toutes et tous, musulmanes comme non-musulmanes, sont traités avec dignité et respect. 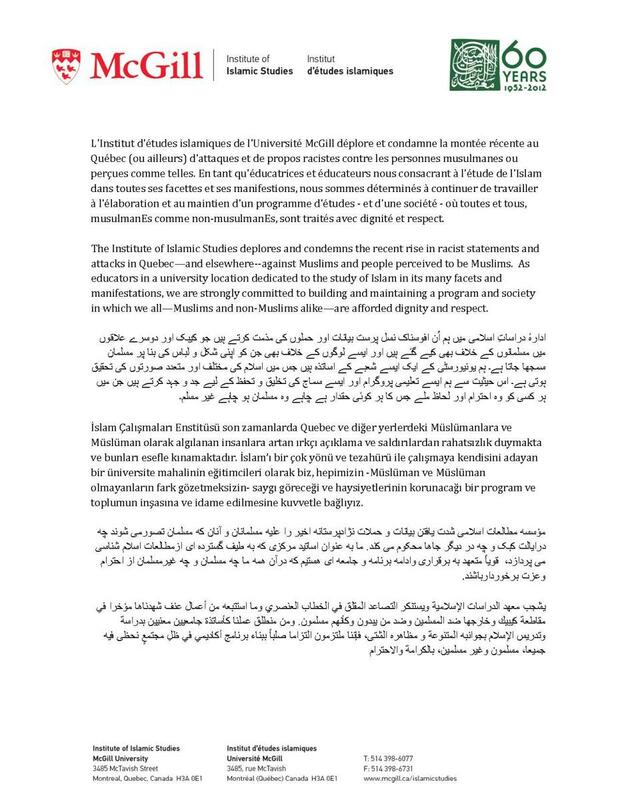 The Institute of Islamic Studies deplores and condemns the recent rise in racist statements and attacks in Quebec—and elsewhere--against Muslims and people perceived to be Muslims. As educators in a university location dedicated to the study of Islam in its many facets and manifestations, we are strongly committed to building and maintaining a program and society in which we all—Muslims and non-Muslims alike—are afforded dignity and respect.